Having spent most of my cooking-life working and living in Lincolnshire, I have a huge love for anything created in the county. I have close working relationships with suppliers that we use for the restaurant and my outside catering company, The Lincolnshire Chef. With so many brands and producers to choose from, it’s never been more important to know and understand where our food comes from and the processes taken before it arrives on our kitchen counter. 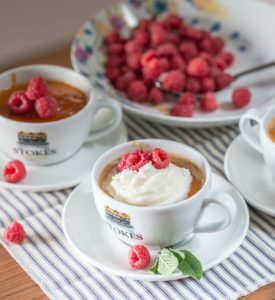 When it comes to tea or coffee, there’s no one better than Stokes of Lincoln. They’ve been making coffee since 1892 and now offer a wide range of speciality roasted coffee and world-wide flavoured teas. 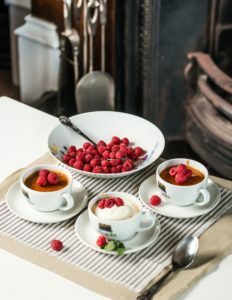 This month, I’m sharing my recipe for a delicious creme brûlée served with fresh raspberries and a cool milk sorbet. This is perfect for a posh summer BBQ or a sit down dinner at home. In a heavy based sauce pan, bring the cream and espresso to the boil. Taking a separate bowl, mix together the egg yolks and caster sugar. Once the cream and espresso has come to the boil, slowly pour into the egg and sugar mixtures, whisking continuously to ensure the eggs don’t scramble and the sift the mixture to remove any lumps. Taking four ramekins or coffee cups, divide the mixture and place into a tray filled with hot water, cover ¾ of the ramekins. Bake for 20-30 minutes until they have a jelly like consistency. Once cooked places in the fridge to cool until ready to serve. To serve, sprinkle over a levelled generous helping of sugar on top of each brulee and melt with a kitchen blowtorch. Top with a generous helping of milk Sorbet and sprinkle with fresh raspberries. Place all of the ingredients in a sauce pan and bring to a simmering heat. Remove from the heat and allow to cool, stirring every half and house to stop a skin from forming and repeat for 3 hours. Churn in your ice cream maker on its sorbet setting and store in the freezer until you’re ready to serve. Tip – If you don’t have an ice cream maker, pour the milk mixture into a plastic container, place into a freezer and stir regularly with a fork.